1746 College of New Jersey is founded by Presbyterian "New Lights" as alternative to "Old Lights" (anti-revivalist) of Yale. It was moved to Princeton in 1747 "Under God's power she flourishes"
Princeton University: Princeton's first President, the Reverend Jonathan Dickinson, declared: "Cursed be all that learning that is contrary to the cross of Christ." The four originators of the College of New Jersey were moderate-leaning members of the "New Lights." Three of them were graduates of Yale: Jonathan Dickinson-pastor at Elizabethtown, Aaron Burr-pastor at Newark, and John Pierson-pastor at Woodbridge. The fourth, Ebenezer Pemberton-pastor of the Presbyterian Church in New York, was a graduate of Harvard. The "New Lights" believed in revivalism and were happy to have George Whitefield as a guest to their pulpits. William Tennent, they felt, was a bit too flamboyant and intrusive. It was Samuel Davies who sailed to Britain in 1753 with fellow minister Gilbert Tennent to raise money to build Nassau Hall for the College of New Jersey (now Princeton University) and served as its president from 1759 to 1761. The first charter was granted by John Hamilton, an Anglican Acting Governor who granted a charter to Princeton when the previous governor would not. He was attacked by the Anglicans who said he was not really qualified to grant the charter. The next governor, Jonathan Belcher, was a graduate of Harvard and a Congregationalist. He issued another charter in 1748, which addressed the concern for "State as well as Church" by making the governor of New Jersey a trustee. The charter also appointed four members of the Provincial Council, two members of the Society of Friends and other prominent laymen, two members of the Episcopal Church, and one member of the Dutch Reformed Church to a board of trustees. Reverend Jonathan Edwards was involved with the ministry of the College of New Jersey for 23 years but left Northampton amidst theological controversy. He later wrote a letter to the Reverend Aaron Burr about the "great design" of the College of New Jersey. Edwards refers to the close bonds that linked himself to like-minded ministers in other parts of America and in England and Scotland. Various plans for a fundraising tour were being discussed, and the promoters of the college were looking abroad for help from their brethren. Burr, President of the College at that time, was among those being mentioned as a possible leader of such a mission. From the Great Awakening onward, evangelical Christians have founded colleges to train a ministry to deliver their message. The College of New Jersey (later Princeton) was founded in 1746. 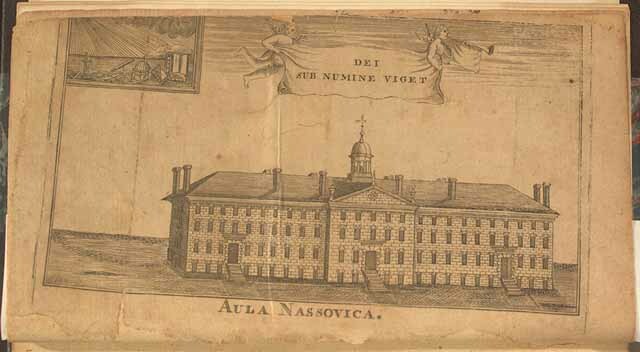 A fundraising brochure for the new college was prepared in 1764 by Presbyterian Samuel Blair, Nassau. Jonathan Belcher was the colonial governor of Massachusetts and New Hampshire from 1730-1741 and governor of New Jersey from 1746 until the year of his death, 1757. He also founded the college now known as Princeton University to promote knowledge of both good government and Christianity. He had a definite view of government that was shared by Christians of all ages which provides an insight into the mind of Early America. He believed that a "good ruler" must serve as the father of his people and care for their welfare as much as a father cares for the well-being of his own child. We should all follow the golden rule as laid out by Jesus. A compassionate man, Jonathan Belcher often helped and befriended the powerless in his governments. He was a "terror to evil doers," but to those who lived righteously, he was a firm and faithful friend as written in his biography written by his friend Aaron Burr, Sr. (1715/16-1757), then president of the Princeton college. Jonathan Belcher highly valued truth and morality, fairness, justice for all (regardless of social status), and impartiality. He was in favor of religious liberty, regardless of which Christian denomination. He favored changing the inheritance laws so that women, as well as men, could inherit property. He protected the persecuted common people and championed their right to personal safety and freedom. For instance, when he was governor of Massachusetts and New Hampshire, he stepped in to prevent a lieutenant governor from illegally flogging colonists in violation of their civil rights. He diligently supported the American militia not only in Massachusetts and New Hampshire, but also during the French and Indian War of the 1750's. Governor Belcher urged governors of other colonies to pay their soldiers' salaries fully and promptly, and to give them their back pay. He wanted the American colonies to be united against their common foe while many of his views foreshadowed the rallying cry of the American Revolution for liberty and equality. 1766 Queens College [later Rutgers] founded by Dutch Reformers in New Brunswick, New Jersey. "Sun of righteousness, shine upon the West also"
In 1766 William Franklin, Benjamin Franklin's son who became governor of New Jersey, signed the charter that began Queen's College named in honor of Charlotte of Mecklenburg, associate of King George III. Queen's College was established to train young men for the ministry in the Dutch Reformed Church. During the Revolutionary war, classes were held sporadically in private homes. By 1795, the college had to close for a while due to money woes. To guide student morals, 104 rules and regulations were published. Activities such as dancing and fencing, billiards, cards, dice, beer and oyster houses, firearms, powder, and public ball alleys were declared taboo. No student was to "disguise himself for the purpose of imposition or amusement," "speak upon the public stage anything indecent, profane, or immoral," or "employ a barber on the Lord's day to dress his head or shave him." In 1812, the college was forced to close for the second time to reopen in 1825. In December, the trustees renamed the college in honor of Colonel Henry Rutgers, a Revolutionary War hero and church elder well known for his philanthropy. A bachelor, he devoted $5,000 and the central college bell which still hangs in the Old Queens building of Rutgers. Rutgers was honored, said the trustees, because he epitomized Christian values. "XVIII. That no person shall ever, within this Colony, be deprived of the inestimable privilege of worshipping Almighty God in a manner agreeable to the dictates of his own conscience; nor, under any pretense whatever, be compelled to attend any place of worship, contrary to his own faith and judgment; nor shall any person, within this Colony, ever be obliged to pay tithes, taxes, or any other rates, for the purpose of building or repairing any other church or churches, place or places of worship, or for the maintenance of any minister or ministry, contrary to what he believes to be right, or has deliberately or voluntarily engaged himself to perform. The early settlers developed colonial charters that were decidedly evangelical in their purpose, often expressing a goal for their colony to advance the Christian religion. As the country progressed up to the revolutionary war period, state constitutions evolved from the charters. Those state constitutions served to maintain the order already established by the original charters, the charters based on Christianity.